The center will have 3008 m² (32,378 ft²) of space including four main salons, as well as separate meeting rooms, a foyer, cold and hot kitchens as well as a variety of other event areas that make it a true paradise for conventions. 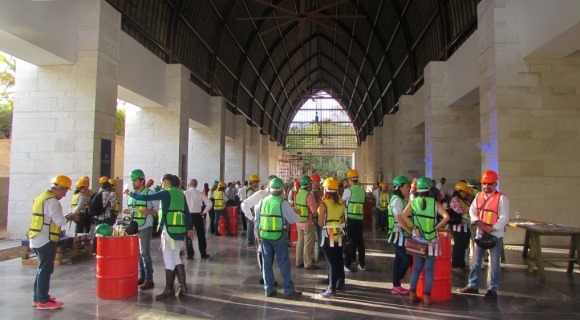 The development presented the new Vidanta Convention Center to the bay area society and media just a few days out from its official opening to share some of the details of this magnificent new construction, which is poised to become the largest convention center in the Riviera Nayarit. The executive committee welcomed the attendees with a presentation of the new facilities and a tour of the development’s latest attractions. The new center will be inaugurated in March 2017 with 3008 m² (32,378 ft²) of space including four main salons, as well as separate meeting rooms, a foyer, cold and hot kitchens as well as a variety of other event areas that make it a true paradise for conventions. The development has over 2,486 rooms available and is already an excellent option for the Meetings Industry in the Riviera Nayarit.